Shipping and handling charges will be added to your order, unless otherwise indicated. All orders are shipped via FedEx, UPS , USPS or LTL Truckline (our preference unless otherwise communicated) Shipping prices are applicable to the 48 contiguous states only. Please call (or email: info@airstarsupply.com) with any order questions or shipment changes. *FREE SHIPPING DOES NOT APPLY TO ANY EQUIPMENT OR BULK ITEMS. International orders shipped outside the U.S. and Canada will be shipped via FedEx , UPS or USPS (our preference unless otherwise communicated). APO boxes (military mail), Canadian orders, Hawaii, Alaska, and all U.S. territories will be shipped via USPS. These orders will incur additional freight charges that will be added to the order and charged to the Customer's credit card of record. Shipping cost on orders outside of the contiguous Unites States will not be shown at the time of checkout, please contact info@airstarsupply.com for options and shipping charges for international orders. International orders ship FOB shipping point; from transportation and/or shipping and handling damages or other situations are the responsibility of the Customer. Canadian orders will incur an additional freight charge that will be added to the order and charged to the Customer's credit card of record. Canadian orders are normally shipped via Airmail Parcel Post (USPS). Customer is responsible for all duties, taxes (including Government Sales Tax), brokerage fees, and disbursement fees. Please check with the proper governmental agency for an estimate of these fees. If a package is refused please be advised that we cannot refund the original shipping charge or the cost to bring the shipment back to Airstar Supply. 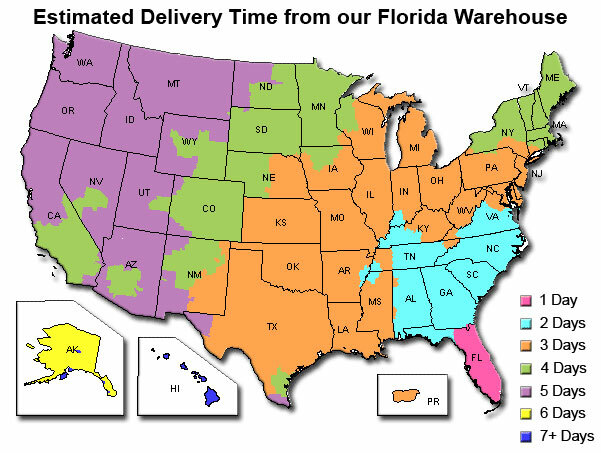 Shipping Lead Times: Unless otherwise noted on our web site, all orders for stocked items are shipped (i.e. leave our facility) within 1 to 3 business days of order placement. Custom or bulk orders leave within 5 to 10 business days. Normal transit time via FedEx, UPS Ground or USPS is 1 to 7 days within the contiguous United States. Next day air delivery is available, upon request, for orders placed by noon EST. Please call us to make arrangements for next day delivery and prices. We make no guarantees to any and all shipping transit times. Attention Consignee: Before accepting a shipment, count the number of cartons and note any shortage and/or damage on the freight bill Before Signing it. Inspect all the cartons immediately. In the event of concealed damages, hold the merchandise and all packing material at your receiving area. You must report any damages within 24‐hours after delivery. Report any damages to the delivering carrier and obtain an inspection report within 7 days in order to file a freight claim. Do not return any merchandise to the original shipper. Please be sure to follow these instructions in order to avoid a delay or be denied a freight claim. No credit will be given for items damaged in transit. The risk of loss and title for all products purchased by you and shipped by Airstar Supply pass to you upon Airstar Supply’s delivery to the carrier for shipment. The risk of loss and title for all products purchased by you and shipped directly by one of Airstar Supply’s vendors pass from such vendor to you upon such vendor's delivery to the carrier for shipment. Shipping Changes: Airstar Supply is not responsible for any lost package that is incorrectly addressed due to customer error. Our shipping labels are generated from the information the customer provides, so if you enter an incorrect or incomplete address (incorrect zip code, missing apartment/suite/office number/name etc.) and your package is lost, Airstar Supply is not responsible. If you contact us by phone after your order has been placed regarding an incorrect or incomplete shipping address, we will make every effort to correct your information prior to your package being shipped. However, once your package has been processed and shipped, we cannot make any modification to your shipment. If your order is lost or delivered to the incorrect address, we are not responsible.